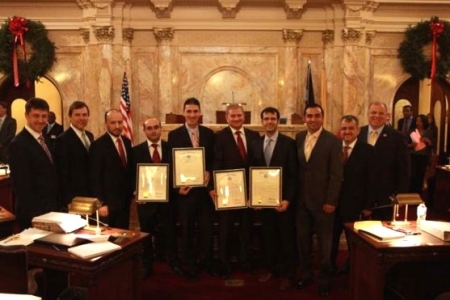 On Dec 3rd and 20th, New Jersey General Assembly and Senate in Trenton recognized Turkish-American organizations for their tireless efforts trying to make a difference in the state of NJ. Peace Islands Institute, Turkish Cultural Center, Turkish American Business Development and Improvement and the Pioneer Academy of Science were honored by both the Assembly and the Senate. On Dec 3rd Assemblyman Gordon Johnson presented the Assembly resolution on behalf of the Assembly. He was accompanied by Asm. Anthony M. Bucco, Asm. Thomas P. Giblin and Asw. Holly Schepisi. After the resolution was presented, the Executive Director of the Peace Islands Institute Mr. Ercan Tozan gave a thank you speech concluding the program. A two-week period after, on Dec 20th 2012, the Senate recognized the above mentioned organizations for their efforts to contribute to peace and dialogue, education, cultural life and business in NJ. "It is the fabric of America of different cultures and nationalities coming together to embrace the American dream. It's fitting properly that we're recognizing The Peace Islands Institute, who provides educational opportunity, where we all learn about their culture, history and desires and how they fit into the American Dream. "I think these are great organizations that play a critical role in our state. We should celebrate what they do and be supportive and partner with them. I believe that it is important for state government to do so. I am familiar with some of the organizations and the work that they do to help those in need to foster greater collaboration amongst religions, amongst different groups of society; [these] are the sorts of messages that we need to perpetuate. So I'm happy that these organization exist to the extent that I could be supportive to their expansion and continuity, I will always do so." I think it's important for us to make sure we bring together as many New Jerseyans as possible. The Peace Islands Institute has been a great initiative to do that and its role in making sure that all of us have a understanding of culture, all of our cultures. And I am excited to be a part of the Peace Islands Institute as being at as many dinners and really getting an idea of what it really makes to be New Jersey. So, for us to take a pause in our action today to honor those great institutions and what they mean for our state is right and fitting". Senate Majority Leader Sen. Loretta Weinberg spoke about Turkey being a fabulous country and having the opportunity to visit there with the Peace Islands Institute. She added that the Turkish Cultural Center has done so much to bringing cultural understanding between among our citizens. Having attending a lot of our programs, she gave a special thank you for all that these organizations did to increase educational opportunities for young people, most of all for creating new path ways for people to communicate and understand each other. Sen. Anthony Bucco said he had the opportunity to be involved with the organization for some years now. He spoke about having the chance to accompany the Peace Islands Institute for our meat distribution to soup kitchens and food pantries for people who are less fortunate to reach the opportunity to provide themselves meat and hot meals. He thanked the Peace Islands Institute for the act of kindness and generosity. He said he greatly appreciates all that the Peace Islands Institute has done. Sen. Theresa Ruiz named the Peace Islands Institute's Art and Essay Contest being a phenomenal project for the students across the state on awareness for violence and issues facing the state nationally and globally. She added "just the impact that they've had on opening their doors to allowing us to have conversations about educating ourselves about cultural awareness, it is something that we should all be committed to." "In the state of New Jersey we are a melting pot of so many different cultures and so many different backgrounds. Unfortunately not all of the groups reach out to every one of us. We need to make sure we reach out to them. But here is a group that makes it really easy for us, they always reach out to us. They make sure we understand what they are all about and they want to understand what it is that we do. I give them very high marks. I wish all citizens were like those members of the Peace Islands Institute." Senate Minority Leader Sen. Tom Kean Jr.